The photos are the result and thinking of a photo session you are mainly creating in your mind the vision of admiring photos, but what about the actual process of the photo session? Every result requires an action, every good result requires not only an action but also enjoying it. Just think about your Caribbean vacation. In order to admire the beauty of the Caribbean sea, you need to arrange a trip, which means book a hotel, airplane tickets. spend 4-5 hours up in the sky (in some cases more) and then finally enjoy the beaches in your resort. And all that process takes time. To appreciate the atmosphere of a nice restaurant and savor the delicious food, you first need to make a reservation, take a car and drive all the way to its location and then wait for your meal to be prepared. It also takes time, do you agree? The same rules applies to having beautiful photos in your photo album or laptop – first comes the photo session. 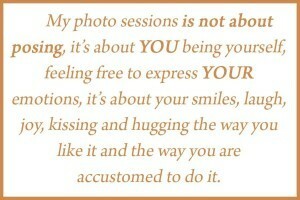 My photo sessions is not about posing, it’s about YOU being yourself, feeling free to express YOUR emotions, it’s about your smiles, laugh, joy, kissing and hugging the way you like it and the way you are accustomed to do it. In this case I am not only a photographer but also a director guiding you and making all the scenes look the most appealing way. Such personal and photojournalistic approach takes time! All this is the main clue to transferring and showing your individuality and the beauty of your relations on the photos. Don’t worry if you don’t know how to pose. Just be prepared to have fun and receive beautiful photos. And if having amazing candid pictures is your goal, I will be glad to help you archive it.